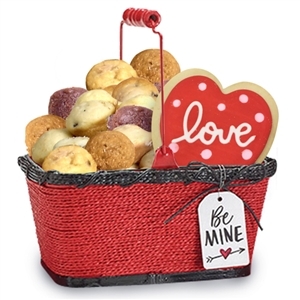 Send a charming hand painted red wood basket with black trim rope accents at the top and bottom for the true muffin lover on that special day! There's nothing like starting the day or indulging anytime of the day with a sweet selection of our delectable baked to perfection mini muffins. 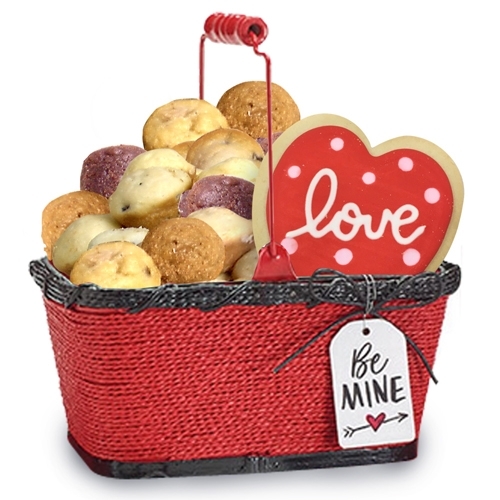 Included are 24 mini muffins assorted delicious flavors as well as a 4 inch decorated heart shaped, frosted butter cookie. After all the muffins are gone, the basket which comes with plastic liner can double as a planter. Of course, all muffins are individually wrapped for the ultimate in freshness. This gift includes a free gift card.